If you or someone you know feels hopeless or contemplates suicide, there are numerous resources available in our community. Image courtesy of Snohomish Health District. From a Snohomish Health District news release. As students wrap up their school years and head into summer, new data shows that parents and community members should be aware of signs to look for if someone is in crisis and where to go for help. An increasing number of Snohomish County teens say they feel sad or hopeless, have thoughts of suicide, or have attempted suicide. The latest release of the 2014 Healthy Youth Survey data focuses on issues surrounding mental well-being, social support and risks of unintentional injuries. All fourteen school districts in Snohomish County participated in the surveys distributed last October, adding up to 11,852 sixth, eighth, tenth, and twelfth graders whose answers shed some light around the health of our youth. More students say depression significantly affects their daily activities. Youth were asked if they have ever felt so sad or hopeless every day for more than two weeks in a row that they stopped usual activities. While 6th graders were not asked, 28.2 percent of 8th graders, 36.3 percent of 10th graders, and 35.8 percent of 12th graders said that applied to them within the past year. Suicide planning and attempts continue to rise. There has been little to no improvement since 2008 in the number of youth who have seriously considered attempting suicide, have made a suicide plan, or who attempted suicide. Statistics for 6th graders have stayed relatively unchanged, with 15.9 percent saying they have seriously thought about it in 2008, compared to 16.2 percent in 2014. However, the numbers have increased by 3 to 4 percent in all other grades for the same time period. Sophomores at slightly higher risk. In 2014, 1 out of 10 sophomores admitted to attempting suicide, 21 percent had seriously considered suicide, and almost 18 percent had planned out how they might do so. This compares to 4.8 percent of 6th graders, 8.8 percent of 8th graders, and 8.2 percent of seniors who had attempted suicide. Youth are in need of adults they can turn to for help. Nearly 1 in 5 students report that they do not have a parent or trusted adult that they feel comfortable confiding in or asking for help from. Among high school students, about 80 percent of teens felt they could seek help from a parent, compared to 86 percent of 6th graders. Only 70 percent of 10th graders had an adult in their life, other than a parent, that they could turn to in a crisis. “These results are quite distressing, but there are strategies to help our youth,” said Dr. Goldbaum. If you or someone you know feels hopeless or contemplates suicide, there are numerous resources available in our community. 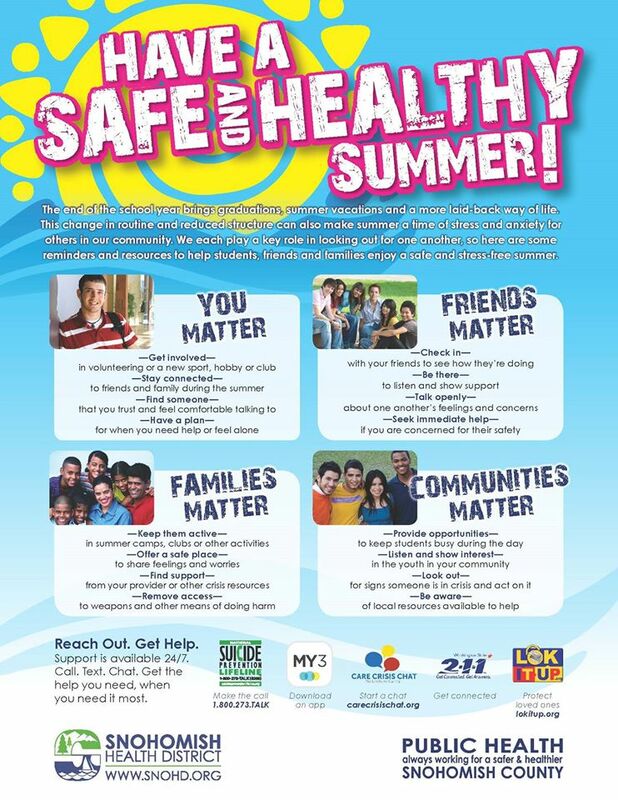 Visit the Health District’s Youth Suicide Prevention page for a list of sites, phone numbers and apps available 24/7. Suicide prevention—for both youth and adults---was one of the top three priority areas identified in the Community Health Improvement Plan. The plan lays out a number of objectives and strategies to be accomplished by the end of 2019. Individuals or groups interested in joining an action team working on one of the priorities, please contact us at 425.339.8650 or healthstats@snohd.org. The Health District has prepared facts sheets on the depression and suicide data, as well as students’ unintentional injury risks. Each one features the most relevant questions and data for students in our county, as well as suggestions for what parents, schools, community groups, and government leaders can do moving forward. The Healthy Youth Survey is completed every two years and asks a variety of questions about substance use, safety behaviors, diet, physical and mental well-being, and school atmosphere. To learn more, visit www.askhys.net.